Wanderlust, the world’s largest multi-day yoga festival, takes place at Stratton Mountain, Vermont, June 21-24. Stratton Mountain will be buzzing with activity this summer. Live music, the world’s largest multi-day yoga festival, outdoor challenges, fireworks and good old summertime fun fill the calendar from spring to fall. The calendar will continue to be updated, so please check www.stratton.com/events for the most recent information! Below are the 2012 summer highlights. Wanderlust, the world’s largest multi-day yoga festival, is everything a yogi, nature lover, music fan and localvore could wish for. The festival features yoga classes, guided meditations, hikes, concerts, local and organic eats and lectures for young or old and everyone in between. Come for one day or four, wander the Market without a ticket or try your hand at something new for any ability level. An all-American weekend to ring in the fourth of July at Stratton. A full day of music on Saturday, capped off by evening Independence Day fireworks. Pie eating, whiffle ball, outdoor games, hay rides, horseshoes, a giant slip and slide and much more fill the weekend. Warm summer nights and live music go hand in hand making Stratton’s Saturday Under the Stars the place to be starting on July 7 and continuing weekly through Labor Day. Held in the base area, this summer concert series is a fun, free event for the entire family with food and beverage for purchase on site. So pull up a chair, bring a blanket and get your groove on under the great weather. The Sixth Annual Tour de Bondville is a bike ride, golf outing and after party benefiting the Breast Cancer Research Foundation. Whether you choose the 50, 25 or 18 mile bike ride or want to spend the day on the links, join us for a day celebrating the best Vermont has to offer and to raise money for a good cause. A sprint distance triathlon that lets you swim, bike, and run in one of the prettiest parts of the USA. The half mile swim takes place at the Snowmaking Pond, followed by an 18-mile road bike course of classic New England cycling and a 3-mile run. Four legs are just as welcome at Stratton as two! Bring your furry friend along for a vigorous 5k Fun Run/Walk. Money raised benefits Second Chance Animal Shelter. The Vermont Challenge is a 3- or 4-day bicycle tour through southern and central Vermont which draws upon the creative energy of local businesses and people of Vermont, ski resorts, restaurants and farms in each local community that we visit. See the beauty of our part of Vermont from behind your handlebars during this unique event and take the Challenge! Come up to the lush Green Mountains of southern Vermont for a Labor Day Weekend full of live music, local food and healthy competition! Columbus Day Weekend will be jam packed with family fun, fall foliage and a run to the Summit. Events include the annual Chilifest Cookoff, Brewfest, the North Face Race to the Summit and all-American summer activities like hay rides, apple picking and much more! For more information on Stratton and events, visit www.stratton.com. MONTPELIER, Vt. – The ideal Vermont foliage experience involves total immersion. 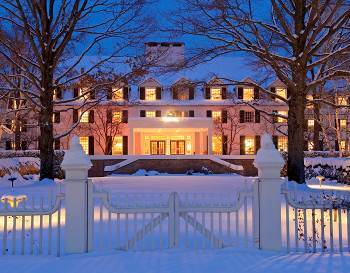 Take time to meander back roads and find the perfect resort or historic inn; grab a warm blanket and stay a while. Visitors can complete their calendars with more Vermont Fall Foliage Events or review comprehensive Fall Foliage information at VermontVacation.com.